The Model Views window displays a variety of different views on the model data, providing an alternative to the Project Browser. 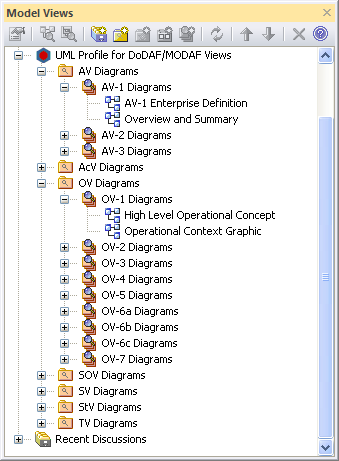 The MDG Technology for UPDM uses this window as a quick and easy method of locating all of your diagrams in the current model. To open the Model Views window, select 'Start > Explore > Model Views'. Double-click on the required diagram to open it.